Want to send out a HUGE thank you to all who came out to the WW4 at E3rd on January 11, 2011! The dancers brought a great energy to the room there — eating the amazing food, drinking the good drinks, having a good time, dancing to rad music, watching funny videos on the screens, and shakin’ some groove thangs. We had a blast, and hope you did too! We’ll get the photos from the night up soon. In the meantime……Shhhh… Hear That? Where’sWestie Podcast #4 is among us, and it is RED HOT & Sizzlin! BE sure to give a listen to this latest-episode from Doug and Pete….. and Jack. What? That’s right. This time around we’ve invited the now-engaged (Congrats to you and Rachel!!) Master DJ Jack Smith to the Where’s Westie studio for a special Podcast filled with fun and hilarity. Join us — as we learn more about Jack Smith and his own favorite songs to dance to and DJ. And also, as usual we slap down some pretty bangin tunes to thrash to. I mean WCS dance to. So sit back or grab your favorite dance partner, listen up, and enjoy the show. Droid. Midnight – 1:30 AM: Anything goes … Doug & Pete mix it up. 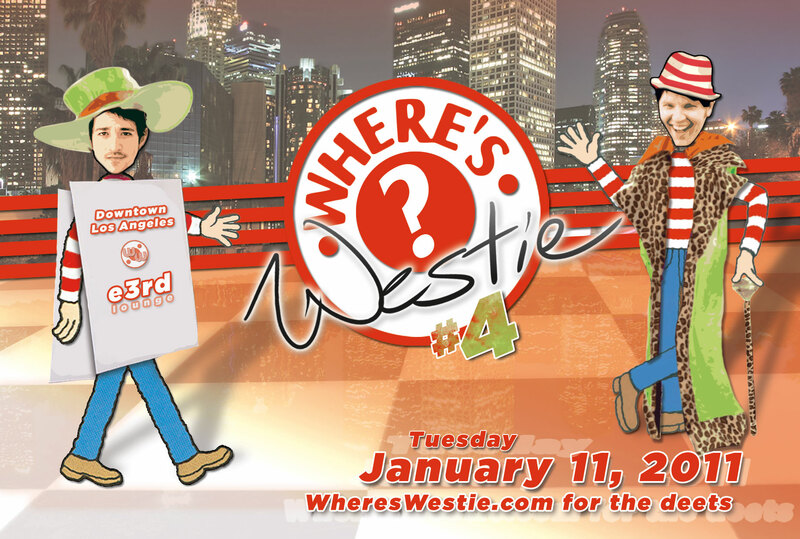 • Post 3x on FaceBook that you’re going to Where’s Westie … once per day … on January 9, 10, and 11 and RSVP on the FaceBook WW4 Page … then e-mail us at doug@whereswestie.com to let us know that you’ve accomplished your mission! Don’t have a FB account? Seriously?! Sign up. It’s free. Join the sensation that’s sweeping the globe and log on! And of course, if you haven’t listened to or downloaded the MP3 of our podcasts yet … DO IT!